Kota Kinabalu, formerly known as Jesselton, is the city capital of Sabah. Strategically situated in the Northwest Coast of Borneo Island, facing the South China Sea and Tunku Abdul Rahman Park on one side, and set against the backdrop of Mount Kinabalu; this beautiful ‘Nature Resort City’ stretches for miles along the coast and towards the inland. 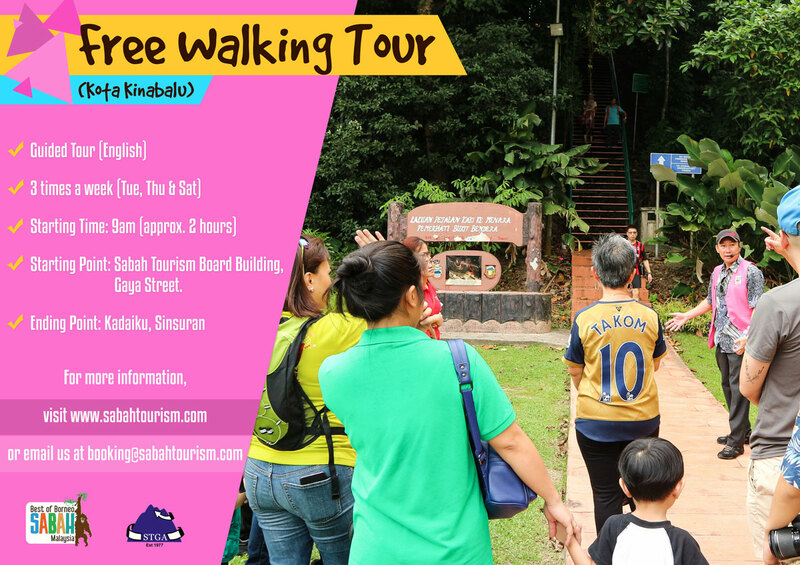 Affectionately known as KK by the locals, Kota Kinabalu is a popular tourism getaway and a major gateway into Sabah and Borneo Island. Kindly bring your own water, food and sunscreen. Meeting point is at Sabah Tourism Board building in Gaya Street. FUN FACT: Sabah Tourism Board is a building located in the city of Kota Kinabalu as one of three oldest building in the city other than the Atkinson Clock Tower and the structure of the former Land & Survey Building, with the building formerly housing a post office one of the most thriving industrial and commercial centers in East Malaysia.